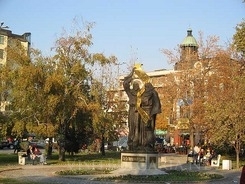 Pazadrjik city and hotels in Bulgaria. Location: Pazardjik is situated 205 metres above the sea level, along the river banks of Maritsa River, running through Pazardjik- Plovdiv Field of the Upper Thracian Plain. 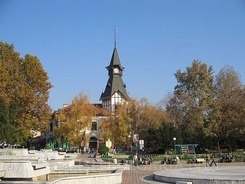 It is located 114 km south-east of Sofia and 36 km west of Plovdiv and is a regional centre. The symbol of the town is the tower clock, a beautiful architecture building with a variety of trade centres and a coffee shop with garden on the first floor. History: The area was inhabited from the Neolithic and the Bronze Ages. The fertility of the fields on these lands was a very attractive place for settlement since ancient times. That is why the Pazardjik field keeps the history of Thracians, Romans, Slavs, Byzantines, Turks and Bulgarians. Most of the historical events of the town are represented in the Regional Museum of history, which features exhibits from the Paleolithic Age to the middle of the 20th century. Sightseeing: The Holy Virgin Cathedral church of “St. Bogoroditsa” is one of the most valuable artistic and architectural monuments of Pazardjik. The cathedral was built in 1837 of pink rhyolite. It is a masterpiece of the original Bulgarian building style. The wood-carved iconostasis is one of the best samples of the Revival Art on the Balkan Peninsula. Another interesting tourist attraction is the Ethnographic Museum. The unique exhibitions are housed in a building from 1850, which is actually declared a cultural monument itself. There are also some interesting house-museums, presenting the personalities, the works of Konstantin Velickov, Svetoslav Dospevski and Georgi Gerassimov – famous artists, who used to live in Pazardjik. 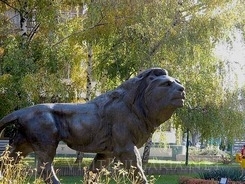 “Svetoslav Dospevsk”i Art gallery, “Konstantin Velichkov” Drama Theatre, “Maestro Atanassov” Music Comedy Theatre and a Puppet Theatre are open for visitors in the town. Vicinities: Only 8 km from Pazardjik, Yunatsite Settlement Mound is situated. It is the biggest mound in Western Bulgaria and is located on the lands, which used to be on the main road from Europe to Asia. The mound reveals many archaeological findings, dating back to the second millennium before Christ. Peshtera is a small town, situated 20 km from Pazardjik. A centuries old tree, with a 26 metres height and drunk with 3.5 metres diameter is a famous attraction in the town. Peshtera is also popular as the town of “Peshtera” Bulgarian “rakia”, which is a traditional strong spirit drink. Wine and Dine: There are many clubs, places for entertainment and restaurants, where the visitors of the town can relax and have fun at.